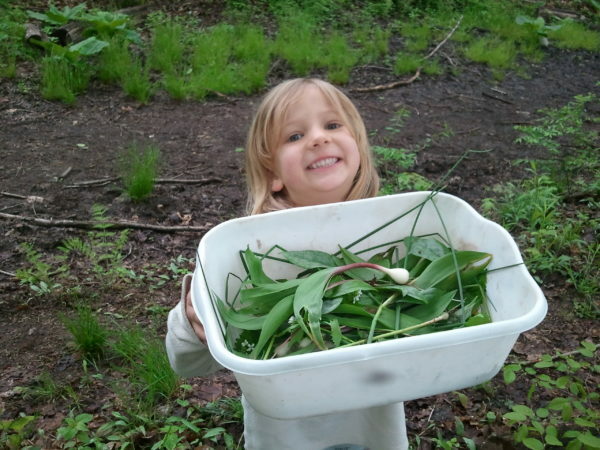 This installment in our Kids’ Nature Night series is all about foraging for edible wild plants! After we learn how to positively identify our local edibles, we’ll take to the trails to harvest ramps, chives, trout lily, garlic mustard, Japanese knotweed, and dandelions. We’ll bag our bounty up and make recipe cards for tasty treats to make at home, such as knotweed juice (that can be sipped from a knotweed straw!) and a spring greens salad. A brief info sheet on the plants harvested will be sent home with your child. This is a drop-off program, open to children ages 5-12. We’ll be outside for most of the evening, so please dress your children in appropriate clothing and footwear. Includes campfire dinner which consists of hotdogs or veggie dogs with all the fixings, and juice. Please feel free to send your child with an alternative dinner from home if you prefer. $25/child for members; $30/child for non-members. Please email our Education Coordinator, Sena, at gro.w1555590272olloh1555590272taerg1555590272@anes1555590272 for more information or to register.